Home Baking is another splendid book from husband and wife author team Jeffrey Alford and Naomi Duguid (Flatbreads and Flavors; Seductions of Rice; Hot, Sour, Salty, Sweet), and is their most accessible book yet. Once again the authors went on a culinary search to bring readers a tour of the world’s baking traditions and to meet home bakers. Their journey includes such diverse visits and specialties as Montreal bagels, Russian Apple Pancakes, Manhattan pretzels, and many of their own stay-at-home favorite recipes such as Naomi’s Skillet Cake and a pretty tempting butter tart. Naturally, bread is heartily featured in Home Baking, but there is also a nice selection of sweets, savory tarts, and cookies to round out any home baker’s repertoire. As with all of their books, the writing in Home Baking is superb, the recipes and instruction are flawless, and it is filled with gorgeous photographs that really do capture the people, their kitchens, and places these talented authors and home cooks visit. Never pretentious, Jeffrey Alford and Naomi Duguid’s books are as beautiful and stylish as they are personal and functional; reference books that will travel from coffee table, to bedside table, to kitchen counter. 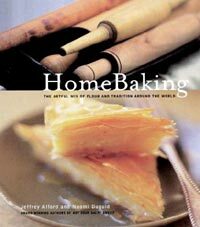 Home Baking is an essential cookbook for anyone who loves to bake, or simply admires those who do.